Gum disease is a common problem among adults in the United States. As common as it is, however, it is a largely misunderstood condition. Many people dismiss it as a minor problem. They may have no idea that it can cause devastating, long-term consequences to a person’s oral and overall health. A dentist in Beaumont is here to explain exactly what gum disease is, how it progresses, and how you can save yourself from becoming one of its victims. Simply put, gum disease is inflammation of the gums. It occurs when harmful bacteria sneak into the gums and produce toxins that irritate the surrounding tissue. This usually happens as the result of poor oral hygiene, but other factors, including genetics, can also contribute to the condition. In its earliest stage, gingivitis, gum disease presents mild symptoms. You might notice that your gums bleed easily when you brush or floss, or that they appear red and swollen. As long as gingivitis isn’t allowed to get worse, it causes no permanent damage. It’s often possible to reverse gingivitis with a few adjustments to your oral hygiene routine. Your dentist or dental hygienist can coach you on how to keep a clean mouth and achieve healthier gums. If gum disease progresses, it becomes periodontitis. At this point, the bacteria have caused irreversible damage to the gums and the bones that support the teeth. The gums may recede, exposing the sensitive tooth roots. It’s possible that pockets of pus may form within the mouth. The bacteria that gets trapped in the mouth can also lead to chronic bad breath. A deep cleaning of the mouth, which removes bacteria both above and below the gum line, may be able to stop periodontitis and give the gums a chance to firmly reattach to the teeth. In advanced periodontitis, the damage to the gums and bones becomes so severe that the teeth may become loose, leading to the need for extractions. When gum disease is this severe, surgery may be necessary to repair the gums and give the mouth a chance to heal. Fighting gum disease is about more than preserving your teeth. 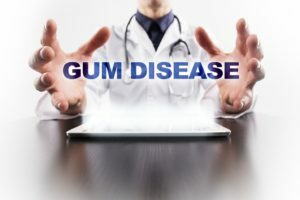 The bacteria that causes gum disease can sneak into the bloodstream and contribute to serious systemic health conditions, including dementia, certain types of cancer, and cardiovascular illness. Therefore, you should do all you can to prevent yourself from developing even a minor case of gingivitis. Regular checkups with your dentist, along with a diligent oral hygiene routine, can help you protect your gums and maintain a healthy mouth. Gum disease is nothing to take lightly. Learn to recognize the signs and symptoms of this condition so you can stop it before it enters its advanced stages and endangers your oral and overall well-being. The team at West End Dental Group has been serving the Beaumont community for years. We provide general dentistry services in a welcoming, kind environment. If you’re concerned about gum disease, or if it is simply time for your next checkup, we’d love to help you out. Contact us at 409-860-9600 to schedule an appointment or to learn more about our practice.